Fence and Gate Supplies is the company to trust when in need for a high quality Cantilever Gate. A cantilever gate design is supported from one end as it opens and closes. Because of this, the need for a track requirement is eliminated across the gate opening. It can also span widths of up to 10m. 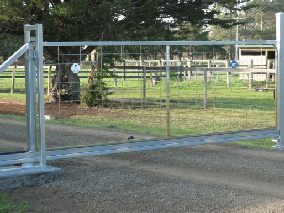 Since it slides along the fence line, it eliminates the lateral space requirement needed by swing gates. For uneven grounds, Cantilever Gates are the best option. They are perfect for over block paving, grass, gravel, and also, water. A Cantilever Gate glides on two sets of support rollers. These rollers are attached to a concrete foundation. This ensures a reliable, smooth, and also silent operation. Even more, you don’t have to ensure the ground is level. They work on steep inclines. No wheels on the ground are needed. Therefore, snow, ice, and also any debris on the driveway won’t affect the movement operations of the gate. Since a properly designed, fabricated, and installed Cantilever Gate will reduce friction when being used, it will also prolong the life of the gate operations. Cantilever Gates require no ground track installation. Therefore, depending solely on overhanging structures based off two side posts. This however, makes it easier and also faster to install. Furthermore, there will be no chance of operation error due to ground obstruction or weather causes. This is because cantilever gates do not require ground tracks. Lastly, Cantilever Gates are also found to be quieter than floor track systems. This is because of the absence of wheels on the ground. The many benefits of cantilever gates make them suited for high traffic industrial and also commercial properties or any location where a ground track is not an option. Want to learn more? Give us a call on 1300 640 643. At Fence and Gate Supplies, we are dedicated in assisting our customers. Especially in making your gate projects, a reality. Most importantly, if you have any questions about our great range, please do not hesitate to get in touch with us. However, this can easily be done by going to the Contact section of our website. Furthermore, we would be more than happy to assist you. Many more Gate Designs also available to suit your needs!